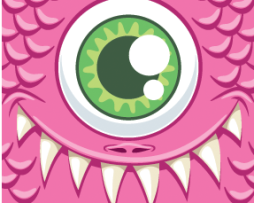 Well what do we have here!…a Purple Chenzo. One that we grew that threw out purple instead of the initial black coloured fruit. Terribly cute this one is hard to beat as an easy growing, hardy and super prolific variety. 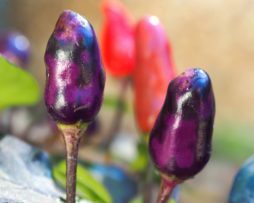 The pods are 2-3 cm long and 0.5 cm wide and look awesome as they fill the bush with purple/green/matte orange and fire engine red fruit. It has a compact umbrella canopy growing habit getting to approximately 1 foot tall. PRETTY and TASTY this one is perfect for patio growing. 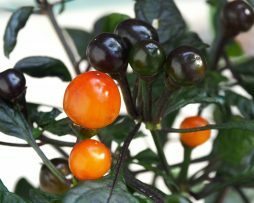 We got seeds of this beauty from THSC as a natural variant of the Red Chilli Costa Rica. 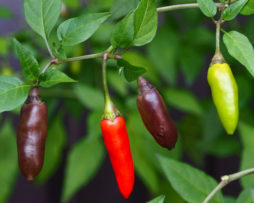 If you love chillies that stand out in the garden then this is one for you. It has deep dark black/green foliage with the leaves turning darker the more sun it gets. The pods are almost a fluorescent orange which contrasts amazingly with the black leaves. Just a stunner. Size wise the plant grows incredibly compact to around 60-70cms with the pods 2-3cm wide and long. 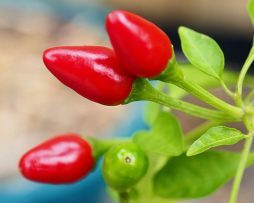 Despite being more an ornamental the flavour is salty and tangy and we think it would make an interesting vibrantly coloured chilli powder. The Piri Piri otherwise known as the African Birdseye is an oldie but a goodie. Ours produces hundreds of pods all year round and short of hitting it with a nuke they’re impossible to kill. Hardy, prolific and super versatile in the kitchen you can’t go wrong with this little cracker. Originating in Guyana Africa they were given their name because of being spread by birds. 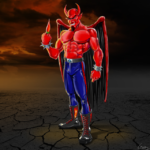 Bird’s Eye peppers add a milder heat than most other chilli peppers – for the seasoned chilli eater that is. 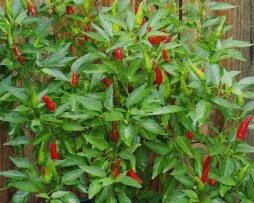 They go great with seafood and can even be ground up and mixed in water to use as a repellent for garden nasties/pests. Absolutely a dream to grow this very rare Persian beauty comes from the city of Tehran in Iran. 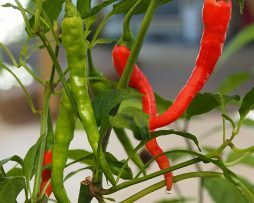 It has a very strong acidic Capsicum Frutescens flavour similar to the tabasco pepper with a bit less heat. Fruit are around 2-3cm long with the plant growing quite bushy and compact.